Once upon a time, one would hear many interesting stories while standing in front of shops or sitting in the galis of the Walled City, where the best paan was sold by Karim and Bundu. Those days are gone; but the street corners, lanes and kuchas, monuments and havelis, still have many a fascinating tale to disclose. They may lack a written history but in an instant they come alive through anecdotes and gossip. Here is a collection of such a potpourri of myths, lores and historical tales, in and around Delhi, from the curious investigator, traveller, storyteller and also a renowned journalist, R.V. Smith. RONALD VIVIAN SMITH journalist, novelist, poet, occultist and historical researcher since 1954, carries on the legacy of his father, Thomas Smith. As a chronicler of the Delhi, Agra, Jaipur Golden Triangle, he has left few stones unturned to discover quaint tales. The present collection is a sample of his quest for things seen by many but comprehended by a few in a mundane age. Khushwant Singh once told him that he would never go stale. The old-timer's prediction may well be true. R. V. Smith has been writing delightful articles in the Hindu and the Statesman for years-in the latter newspaper continuously, for half a century. The repertoire is so wide that it attracts the attention of even people who are in the habit of just flipping through the morning papers. A virtual feast of heady topics is laid before the reader who willy-nilly gets engrossed in it. Sample the stuff offered in this selection-romance, mysticism, history, music, nostalgic tales, great personalities and occult happenings. The aura of the Raj days gives an idea to the younger generation of the events that fascinated their forefathers. World War memories are brought alive too as one reads about Noor Inayat Khan who spied for the Allied forces and met her end at the hand of Nazi soldiers in Germany. Among other outstanding personalities are Hakim Ajmal Khan and also Dr Sen, the early 20th century doctor of Chandni Chowk, hailed as a messiah when medicine had not taken such great strides as now. The charm of Sawan, the rainy month, the music one gets to hear at the dargah qawwalis, the nuances of the erstwhile dancing girls, the Sufiana tradition, little known anecdotes about the Mughals, Diwali, Id, Janmashtami celebrations in times past, the glory days of Majestic cinema where, to see a show in the beginning of the last century, dhobis sold their bullocks and bhistis their mashaqs or waterskins, the exodus of poets, dancers and artists from Delhi to Awadh in the days of Nawab Wajid Ali Shah, and much more is in store for the curious. 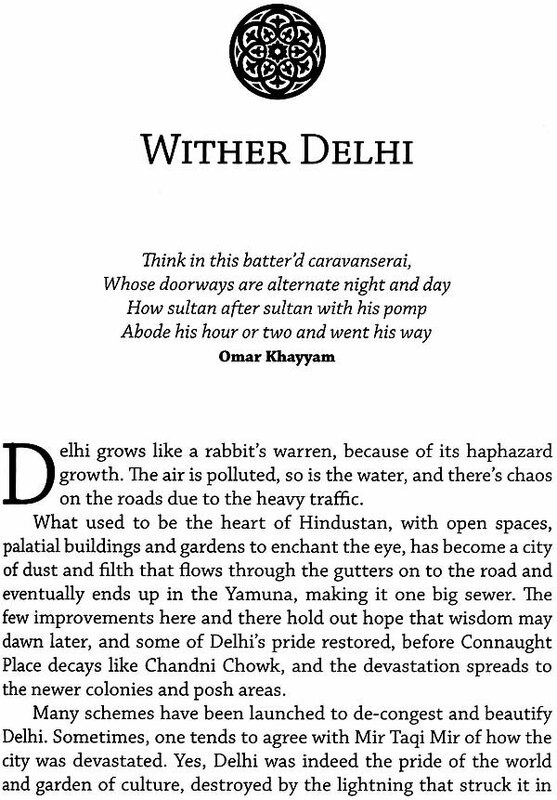 Often called the 'Omar Khayyam of the concrete jungle of Delhi', Smith, a hereditary journalist whose father, brothers and sisters were also into journalism, never ceases to disappoint. I, as an old Delhiwallah with long-time links with the city, have great pleasure in recommending his book to all those who care for a good read. They will get to know so much about the quaint secrets of the galis, kuchas and monuments of Delhi. Introduction Delhi has been described as the 'beloved of many and mistress of none'. I would beg to differ-'mistress' has an illicit connotation; the word 'wife', I think, would have been a better substitute. I shall leave it to you to ponder over. The city was not really 'Alam mein intikhab' in the early 1960s, but the old order was, by and large, still partly intact, and I'm a witness to its breaking up as also the big change when Delhi College was moved to its present location and renamed after Dr Zakir Husain. Wonder if Mirza Ghalib was alive if he would have got appointed as a teacher! Delhi's old-world charm lingers, despite the many changes modernisation has brought about. But it was not so for me when I came to the city, to permanently settle down in it, in 1962, for I could not shake off my love for Agra. So much so that I went to it every weekend and came back rejuvenated after meeting family and friends, soaking in the ambience of the Taj and its environs. Even the kharbuzas (musk melon) of Delhi did not taste as sweet as the ones back home, and the nahari, seekh kababs and biryani of Nai ki Mandi and Naye Basti were far superior to the one available near the Civil Lines, where I stayed with my brother and sister-in-law, both teachers at St. Xavier's. To tell you the truth, I felt very lonely as a bachelor during that time. It was difficult to pass the morning hours after a night shift at the PTI office in Parliament Street, when not courting an English girl teaching in a Mandir Marg school. So to while away the time, I got hold of my father's old bicycle, which had been languishing in the brother's verandah after he dumped it there. My father, Thomas Smith, had been in journalism since 1928- a profession my brothers and sisters pursued as well before they took to teaching. The bicycle was originally a present from American journalist, Dorothy, Wittenberger, who had come all the way to Agra on it from Bombay about 80 years ago-just shows how much safer roads were then. A 'Hopper' model, it served the purpose of taking me around, surveying old monuments, starting with the Red Fort. When I had to leave the staff quarters, I took the steel trunk (my only possession), caught an auto-rickshaw and landed up at Naaz Hotel, behind the Jama Masjid, where I took a room right at the top. This was the time when Pandit Nehru died. The waiters informed me that it had been occupied by the painter M.P. Husain before he became famous. I liked the room as it gave a bird's-eye view of the whole area, but the charges were so high that I was forced to move to the modest Azad Hind Hotel near Jagat Cinema, soon. This hotel belonged to Afzal Peshawari who had seven wives and 28 children. Whenever the wives started fighting among themselves, I used to take shelter in Edward Park and then walked down to the steps of the Jama Masjid to eat kababs and drink water from the jhun-jhun katora-wala bhistis. 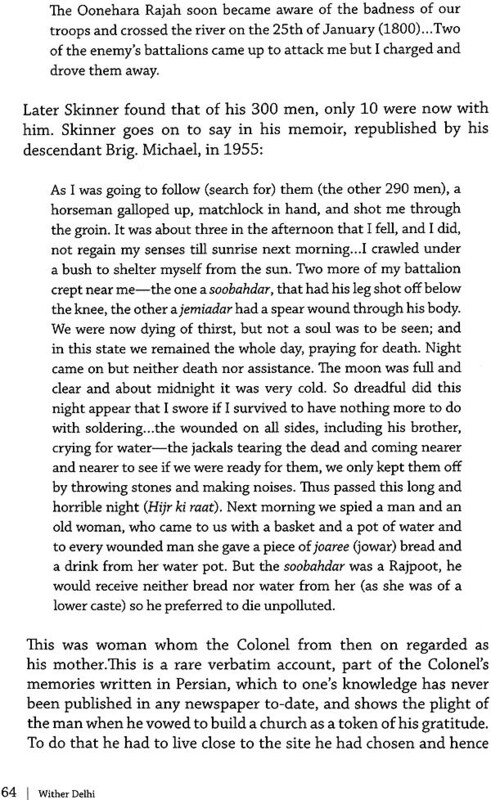 By the time I returned the commotion used to die down and Afzal Sahib would be busy reciting poetry to women who came to buy chandeliers from the shop attached to the hotel, under the charge of his Christian wife, 'Memsahib'. For years I stayed in this hotel-even after I got married. One of my sons was born there while I was on a visit to Agra. A midwife from Macchliwalan helped in the delivery at midnight, thanks to the sympathetic hotel manager, Riyasat-God bless him-and his wife, the ubitiquitous Mumani, a heartthrob. Josh Malihabadi, the renowned Urdu poet, incidentally, was my neighbour at the hotel for three months. After dinner, procured from Moti Mahal restaurant, which he washed down with three pegs of Scotch, Josh retired for the night at 8 pm, to get up at 4 am to write his kalaam while sipping tea. 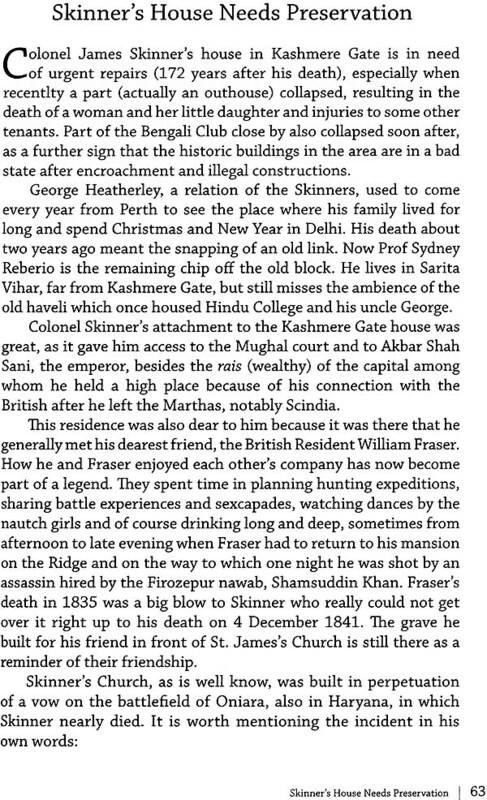 He shared the room with his brother, the Khan Sahib who had continued to stay at Malihabad even after 1947. Josh's wife, who had come with him from Lahore, occupied an adjacent room, keeping a strict watch on him. Poets like Maikash Akbarabadi, Betab, Madhosh and GuIzar Dehlvi came to meet him as he sat on a chair in the courtyard, sharing the hookah with Khan Sahib. That was the year 1967, if I'm not mistaken. Ustad Latafat Hussain Khan, who occupied a room downstairs, sometime sang in his magestic voice. Feroz Kanchwala, the singer with a glass eye; Naseem Bano, who had entertained President Najibullah at a soiree in Kabul; danseuse Shanta Rani, and visiting dance and music troupes from Bombay and Calcutta also made me prolong my stay at the hotel. However, my bachelor-day friends were convinced that I had fallen in love with the proprietor's pretty daughter. Soon, I started loving Delhi and rediscovering its charms with my children who had to eat pulao-zarda brought from a shop everyday (as no cooking was allowed in the hotel) for lunch, while dinner was at Karim's. When they went to visit relatives they would naturally ask for dal-bhat or chutney-roti. My connection with Agra started showing signs of breaking up as my parents died-my brothers and sisters got married and went their way, and friends scattered, some going away to Pakistan and others to the US, Canada and Britain or to Bombay, Calcutta and Madras. Slowly, I became a full-fledged Delhiwallah, thanks to evenings spent at Haji Hotel, opposite the Jama Masjid. There Haji, Zahooruddin, who had been goalkeeper of Young Men's Football club, used to hold court. He was a keen shikari and had hunted right up to the Terai jungles. The deer he shot provided venison from which shammi kababs were made, not only for family and friends, but also for dignitaries like the Nizam, the Nawab of Rampur, the Viceroy and the Deputy Commissioner of Delhi. Present at the evening meetings were Mohammad Mian Akbar, a shoe merchant of note, Bhai Alimo, Us tad Zahooro, Master Sahib and Mian Alamgir who had the facial features of Emperor Aurangzeb. The discussions ranged from the days of the Mutiny to the Majestic Theatre in Chandni Chowk-where, it is told, to see a show dhobis sold their bullocks and bhistis their mashaqs or waterskins. They were fascinated by Sohrab Modi, Mehtab, Prithviraj Kapoor and Zohra Bai Ambalewali. Discussions over, everybody dipped their hands into the big tiffin carrier, which contained Hajiji's dinner, and then departed still arguing on the road, while I made my way to Karim paanwallah's shop. While passing through Urdu Bazaar I used to see Mir Mushtaq Ahmed standing in the balcony after his sundowner. CPI leader M.O. 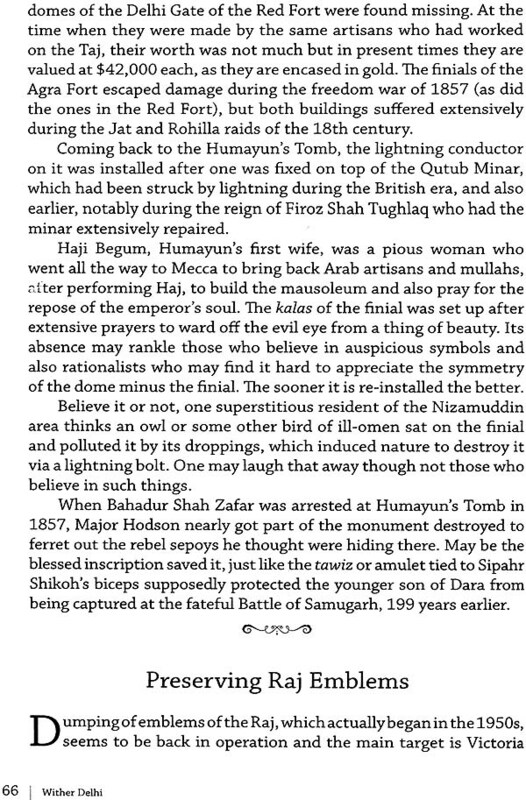 Farooqui lived dose by, and not far from him, Mustehasan Farooqi, caretaker of the shrine of Hazrat Kalimullah. At this mazar many evenings were spent by my small family and me, listening to the qawwalis being sung by the brothers, Chunnu, Munnu and Ibrahim. A regular visitor was barrister Nooruddin Ahmed, sometimes accompanied by his beautiful daughter Amina, who acted as interpreter to Krushchev and Bulganin in 1955. Chaudhuri Abdul Sattar, Municipal Councillor and Imdad Sabri were also seen there occasionally. People thought it was necessary to relish Karim's paan every evening. He had been a wrestler in his youth and even after quitting the akhara taught youngsters the daon-paich (grappling tricks) in the afternoon. He would then go home from where he emerged only in the evening after an oil bath, his kurta scented with the seasonal attar. Though balding he would nevertheless have a lot of chameli oil in his hair and surma in his eyes. Arrayed thus, he would sit at his shop and prepare huge paans with katha-chuna (lime and catechu). Soon his hands would be red as though dyed with henna. The shop, alas, no longer exists; the likes of Pir Yasin Beg, Haji Zahooruddin, Afzal Peshawari and their betters are also no more. However, the fact that the capital continues to draw researchers working on the city's heritage, or on focussed topics like the caste system among Muslims, gives an idea of the charm still exercised by eternal Delhi. Aiye umre raftan chod gaye tu kahan mujhe. Such, alas, is the fate of emperor, clown and commoner alike and history no doubt is witness to it. Delhi has two faces-one which we see every day and the other that is hidden and has to be discovered by lifting the veil. The capital of many kingdoms and now the seat of the Indian Government is the beloved of countless people because of its many attributes. 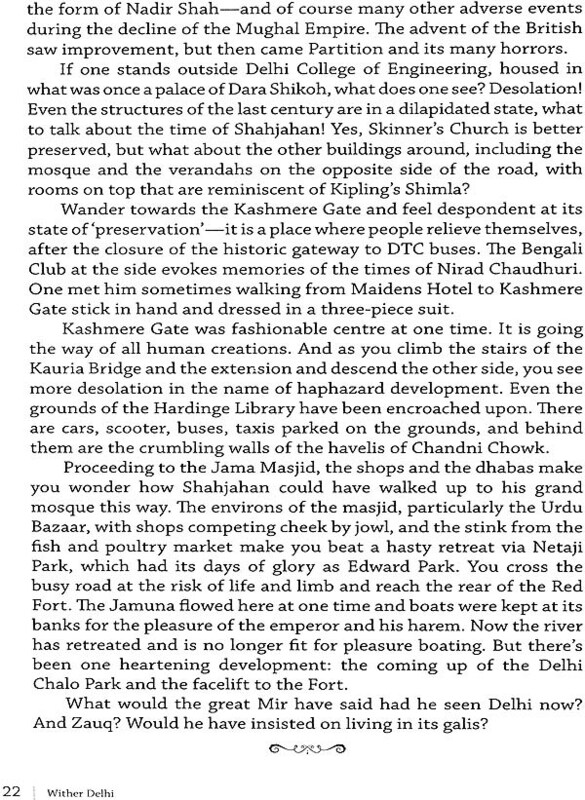 Ever wondered about the history of Chandni Mahal or why a nondescript area is called Zakhira? Chandni Mahal was one of the three palaces of the sons of Bahadur Shah Zafar, which later came into the possession of the emperor's samdhi, Mirza Elahi Bux. When the roof of Ghalib's house fell during heavy rains, the poet is believed to have vainly wished he could occupy Chandni Mahal in comfort, with its owner, till his residence was repaired. Zakhira is said to have been a royal granary in Mughal days. In the decadent period of the 18th century it had a taksal or mint operated by the Marathas-the name still sticks to the place. Sarai Kale Khan, in all probability, was built by a nobleman of the latter Mughal period who lived on to see the aftermath of the 'Mutiny'. But the sarai is no longer in evidence. The more famous Kale Khan was a nobleman of the Lodi period, after whom Kale Khan ka Gumbad is named. But Kala Mahal was Shahjahan's temporary residence in Kucha Chelan when he was building the Red Fort. Many wonder why a bazaar is known as Bengali Market. During the British Raj a piece ofland was given to Bengali Mal, a Rajasthani trader, on which the market was built. Hence the name, although people from Bengal also live there. Panchkuian Road gots its name from the five wells that existed in the area once. You may still find one or two of them in the building that houses a school for the blind, and inside the well-maintained shrine of Hazrat Syed Rasool Numah, who came to Delhi in 1691, some 16 years before Aurangzeb's death. How many know that the War Museum in the Fort once served as the palace of Mirza Jehangir-Bahadur Shah Zafar's half-brother who was exiled to Allahabad by the British. Why is Zinda Pir a living belief? Where was Langre ki Chauki, whose counterpart exists in Agra? Did a lame man really have something to do with it or with a mosque named after him? Why is Bhairon still held in awe and what is the actual story behind this tipplers' temple outside the Purana Quila? Who was Buddhe Mian, mentioned by Ghalib more than once in his letters? His house was blown up in 1857. Was Buddhe Mian a secret agent of the Mughals or the British? Jawaharlal Nehru has observed that every stone of Delhi has a history. This is true about the old monuments that dot the landscape. But not only stones, even people, street corners and stretches of roads have a history, some of it fascinating. Was there a bhoot bangla (haunted bunglow) in the passage leading from the Ring Road to Daryaganj? Some dhobans (washerwomen) reported sighting a wailing woman at night with many infants during the Emergency when birth control measures were enforced very strictly. How did the belief that this woman was Janani Mata (Goddess of Fertility and Birth) gain ground? Many of these spots, including the red-light area, in G.B. Road, lack a written history and much of what is known about them is through anecdotes and gossip. 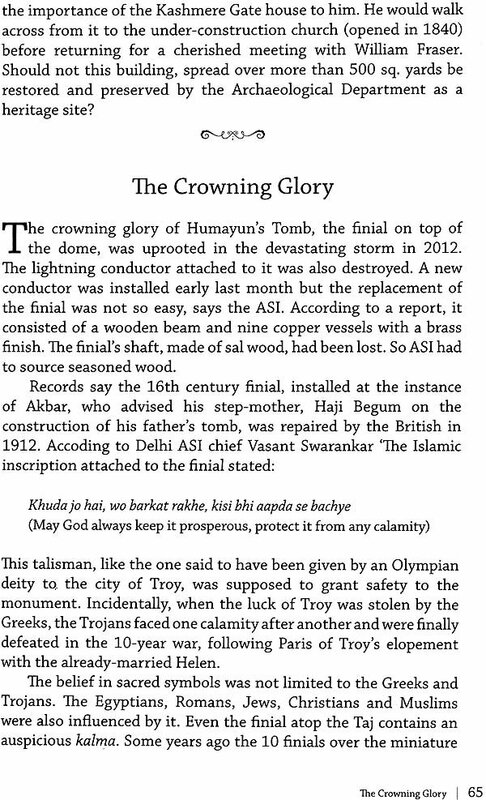 In which kotha of Chawri Bazaar did Lal Kanwar entertain coustomers before she became the mistress of Jahandar Shah? Has anybody been able to discover the surang (tunnel) that is said to lead from Shalimar Bagh to the Red Fort? You can hear a lot about such things while standing in front of shops or sitting in the galis of the Walled City, where the best paan was sold by Karim and Bundu. 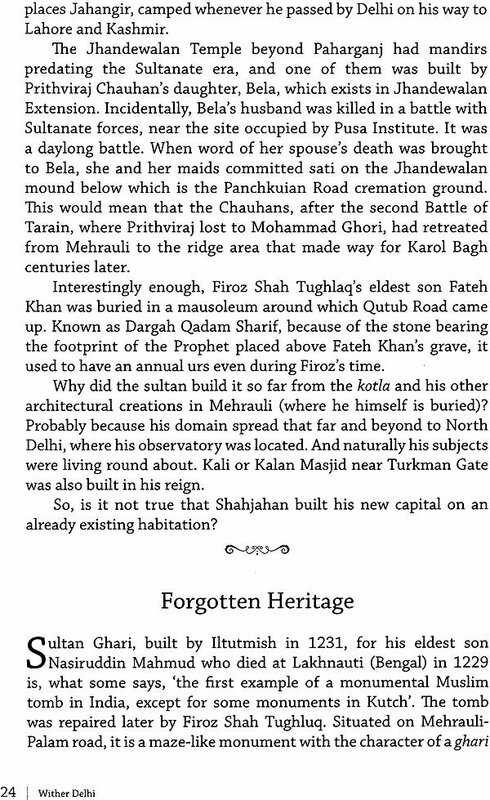 Sultan Ghari is the tomb of Balban's eldest son in Mehrauli, but the villagers regard it as a mysterious building, where one does not venture after twilight. A four-pillared monument exists near Hauz Khas, built by Alauddin Khilji on the orders of the Prophet who appeared to him in a dream, as he did to Iltutmish earlier and directed the slave emperor to build the Hauz-i-Shamsi. In Kashmere Gate, opposite St. James's Church, is a mosque that was built in memory of Shujat Khan, a commander of Aurangzeb, who was killed during the Persian campaign. This mosque was repaired by the builder of the church, Colonel James Skinner, half of whose family from his first wife was Muslim and lived in Meerut. 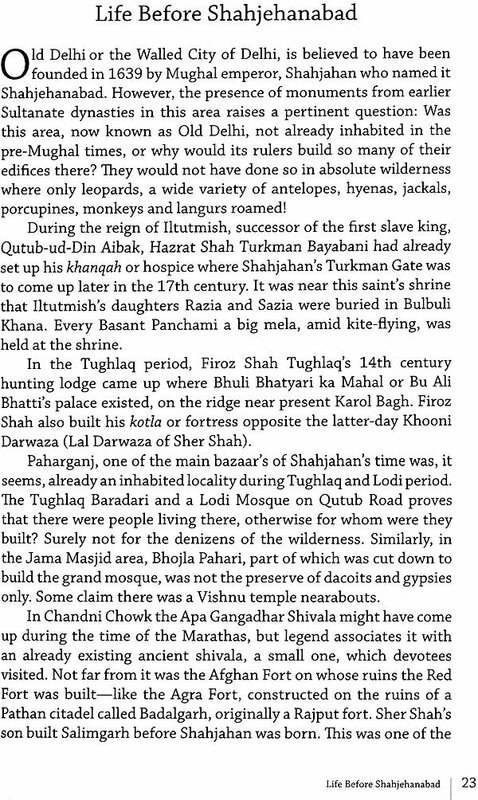 Kamra Bangash in Suiwalan in Daryaganj is now only a memory, but a huge gate, with fish carved on it, marked the entrance to the stronghold of the Bangash clan of Pathans, to which the sarod maestro Ustad Amjad Khan belongs. Bulbuli Khana at Turkman Gate has ceased to exist, but the grave of Razia Sultan is still there, a poor memorial to the only queen who ruled from Delhi. Chandni Chowk has many havelis, one of which belonged to Bhawani Shankar regarded as a turncoat by the Marathas and protected by the British, who resented him being called namak haram (one not worth the salt he had eaten). Another haveli was built by Lala Chunna Mal, banker of the last two Mughal Emperors. In Matia Mahal is a haveli where Ghalib recited his ghazals, seated in the courtyard. Eunuchs still attend the qawwali at Hare Bhare Sahib, but the Seelampur brother, who sang at it are dead. Dauji ka Mandir was once famous for its kheer and khichri and in Urdu Bazaar was a hotel where a poet with seven wives and twenty- eight children lived. And so Delhi, the coy bride, continues to lead its twin existence-the known and the unknown-and only persistent efforts can make one familiar with both.